This entry was posted on February 6, 2014 by Tintean Editorial Team/fdg, in Book review, History and tagged Arthur Coningham, Orangeism. Bookmark the permalink. Anne E. Cunningham: The Price of a Wife: The Priest and the Divorce Trial, Anchor Books, Sydney, 2013. In June 1900 Australian international cricketer Arthur Coningham (37) petitioned for divorce from his wife Alice (31), on the grounds of her adultery. During his frequent absences she had fallen in love with another man, with whom she had had a fourteen month affair, resulting in a pregnancy. Her lover however had broken off the relationship shortly before the baby, a boy, was born in November 1889. According to Arthur, the child could not have been his, as a groin injury suffered in the cause of cricket had prevented him from fulfilling his marital duties at the time. Gossip loving Sydney was immediately attracted to the story but for even more thrilling reasons than the tale of an errant wife of a noble Australian cricketer. The reputed lover, named as co-respondent in Arthur’s petition was a handsome and ambitious Catholic priest, Dr Denis O’Haran, Dean of St Mary’s Cathedral, and personal secretary to Cardinal Patrick Moran. 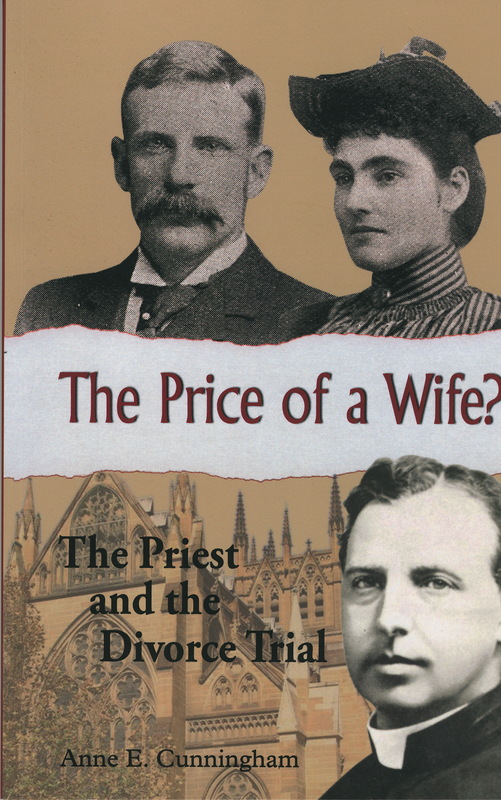 The resulting melodrama, surely one of Australia’s most gripping yarns is explored in Anne E Cunningham’s ‘The Price of a Wife: The Priest and the Divorce Trial’, recently published by Anchor books Australia. It also didn’t help that the judge in the first trial – Sir George Bowen Simpson – was overtly hostile to Catholicism, nor that Arthur soon won the support – financial and political – of the high profile Presbyterian minister the Rev Dill-Macky. Catholic Sydney was further outraged when none of the twelve jury members selected were of their faith. With the consent of the judge, hours at that trial were devoted to exploring Catholic teachings on the confessional, with the implication that since sins could be so easily forgiven, Catholic testimony could not be trusted in courts of law. Feelings ran high and both Arthur and Alice were jostled by angry crowds who gathered outside the courtroom while Rev Dill-Macky went round with a gun, fearful of assassins. The Church had hired one of the best barristers in Sydney, Jack Want. He was also one of the most expensive. He would cost the archdiocese £2,064 ($184,000 in today’s terms). However as Cunningham notes, an enthusiastic laity would soon fully reimburse the Church’s costs – raising approximately £8,000 through fundraising meetings and activities held throughout NSW, as O’Haran was increasingly portrayed as martyr to a vicious, immoral and colluding couple. The Price of a Wife sets out to unravel the complex web of relationships, politics, skullduggery, paranoia, and the flawed and tragic human loves involved in the Coningham – O’Haran divorce trial. In some respects the sheer weight of archival material threatens at times to bog the narrative down. The desire by Dr Cunningham to tell the story as it unfolded within the court, along with the shady dealings of the various Mr Fixits hired by the Church for the second trial, makes for an occasionally confusing read. The book could also have explored more fully and more fruitfully important questions of gender. The promise of the title fails to deliver on gender analysis or on Alice’s outsider status, as English Catholic, as partner in a mixed marriage and as a woman with ‘a history’ inevitably dredged up by the courts . Mary is a writer/ historian with particular interest in spirituality, gender and Irish diasporic culture. Her PhD explored the founding of Our Lady’s Nurses for the Poor in Coogee in 1913 by an Irish Australian mystic, Eileen O’Connor, and the resulting clash between the mystic and the material Church. It was published as Our Lady of Coogee by Crossing Press in 2009. She is currently working on an historical novel concerned with Michael Davitt and the vital diasporic contribution to the Irish Land War of 1879-1882.